As of 1/27/14 Spotswood is no longer selling the mining tray pictured below, instead he is offering an open-frame version which sells for $100. A few weeks ago I started mining for Bitcoins to learn more about Bitcoins and cryptocurrencies in general. Since I already had some extra AMD video cards my initial hardware investment was zero making it easy to get started. Since I’ve started mining I haven’t stopped and I’m now considering building a dedicated Litecoin mining rig with better hardware. Currently I’m mining on spare cards in my primary computer and with summer coming I would prefer to move my mining operations to the basement where the extra heat (and noise) won’t be such a nuisance. I’ve found coin mining to be an interesting, fun, and challenging hobby making it worthwhile for me to pursue. I certainly don’t have any plans to retire from coin mining anytime in the near future but I do think the potential rewards outweigh the risks. Many people in the Bitcointalk forums or on Reddit will suggest simply purchasing Bitcoins or Litecoins instead of investing in a mining rig. Personally I think the hobby of mining for coins is much more fun than just buying the cryptocurrency. I also feel there is less risk involved with building a GPU mining rig. If the bottom of the coin market drops out I can still either sell my mining hardware, or use it for gaming, etc whereas if I had purchased ecurrecy I might have nothing left whatsoever. I plan to make the switch from Bitcoin to Litecoin mining for a couple of different reasons. 1. Based on their current price and difficulty Litecoins are more profitable to mine than Bitcoins. You can plug in the numbers and see for yourself using Dustcoin.com’s mining profitability calculator. Their calculator computes mining profit based on hash rate, power costs, difficulty, and coin prices. 2. ASIC based Bitcoin miners are becoming more prevalent. As more of the ASIC miners hit the market mining for Bitcoins using GPUs will essentially become obsolete, many consider them to already be useless as Bitcoin miners but I’ve still been able to turn a profit. Litecoins are resistant to ASICS so it’s likely that GPUs will remain viable in the near future. As more ASICs come online it is anticipated that more GPU miners will make the shift from Bitcoin to Litecoin which will in turn cause Litecoin difficulty to skyrocket making mining less profitable. If difficulty increases and Litecoin value does not go up then it most likely will not remain profitable to mine for Litecoins. Although many people speculate that Litecoins could see a big increase in value if their adoption becomes more widespread. EndWorldSuckDotCom provides a good general overview of Litecoin mining and profitability calculation. If you’re looking for a low budget rig you might want to look elsewhere. 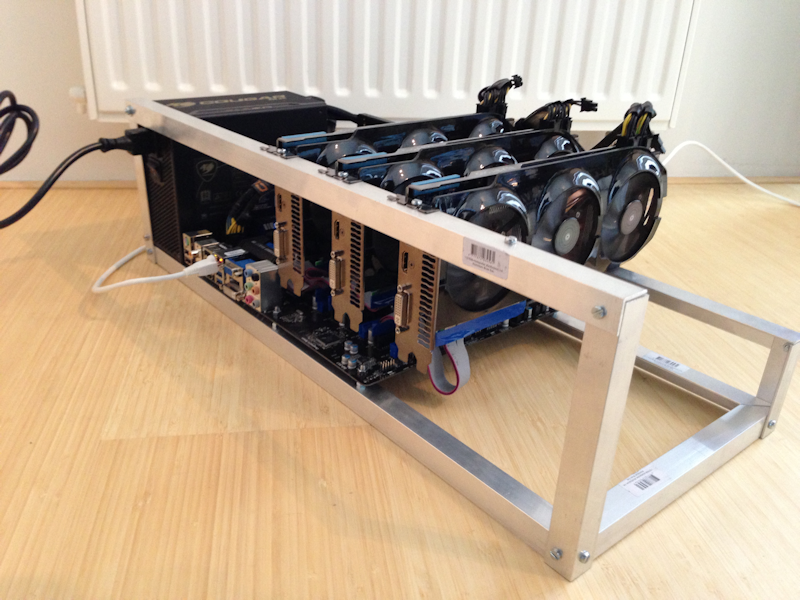 The hardware listed below is based on a slightly modified design of Cryptobadger’s Litecoin mining rig. My modifications include the addition of a custom chassis which will provide a professional, and organized look to the rig. If you’re looking to save a few bucks you can opt for the plastic milk crate recommended in Cryptographer’s guide but I don’t care for the look of the crate rigs. I also opted to include a 1000W power supply (+$30) to provide the option to add a 4th card in the future. Having additional wattage available also prevents the power supply from having to run near it’s maximum output (where they are least efficient). According to the mining hardware comparison page the 7950 card is capable of 600-685 kHash/s depending on the tweaks in use. These estimates put the total Scrypt hashing power of this rig at somewhere 1800 – 2055. Using figures from the Dustcoin profit calculator the rig should generate 3.04-3.47 LTC/day. The specs for the MSI R7950 list a maximum power draw of 200 watts per card. The AMD CPU is rated with a TDP of 45 watts but in reality the CPU draw will probably be less since Litecoin mining puts very little load on the processor. The motherboard, chassis fans, and CPU fan are somewhat difficult to estimate when it comes to power draw. 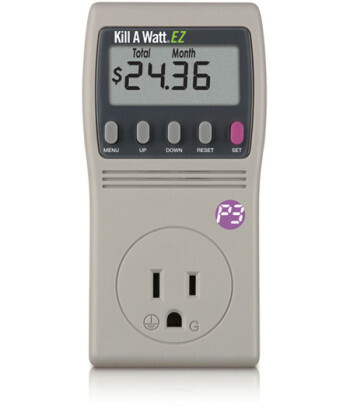 The best way to accurately measure operational power draw is to use a watt meter such as the Kill a Watt power meter. Based on the estimated total power draw of the mining rig we can do some simple math to determine the expected cost for electricity to operate the miner. From these calculations you can see that the power draw of the mining rig, and how much you pay for power have a huge impact on the profitability of a Litecoin mining operation. If you don’t pay for power, or have a method to obtain it from renewable sources (solar, wind, etc) then you have a significant advantage over other miners. Electric costs can also be reduced by increasing the efficiency of the miner itself by undervolting, reducing heat, and using a highly efficient power supply (80 plus platinum). Now that we know how much it will cost to build the Litecoin miner, and how much electricity it will burn during operation we can run the numbers for overall profitability of the miner. I highly recommend using your own estimates for power costs based on your local electricity costs. Cost per kWh can vary greatly between different parts of the country. Please take the estimates below at your own risk, these numbers are based on the value of Litecoins today. Litecoin prices are constantly fluctuating and can be highly volatile. These numbers also do not take any downtime for power outages, hardware failure, or other issues into account. These estimates of ~$200/month equal about a %12 return based on total hardware costs. The downside is that it will still take about 8 months (best case) to recover the initial investment. During this time there is a lot that can happen. 1. Litecoin prices could drop – Based on my electric costs Litecoins must stay above $2.30 in order for me to produce a profit. 2. Litecoin difficulty could drastically increase – If difficulty increases due to more miners (which is expected) this would reduce Litecoins generated per month affecting profit. Some speculate that if difficulty increases so might the value of Litecoins though. 3. Hardware becomes obsolete – Faster , more efficient hardware could be released before the hardware costs are recovered. In this scenario you could be forced to sell your video cards on eBay and purchase upgraded cards. At it stands today Litecoin mining is certainly profitable but there is a fine line between price and difficulty required to keep it this way. If you have existing hardware you can dedicate towards building a miner you will reach the break even point sooner. For those of you like me who are looking to upgrade it is reasonable hardware investment if you interested in mining for more than just the profits. If you have a bullish outlook on Litecoins (as I have seen on many Black Hat World posts), then this may seem like a great deal given the potential gains. There are many things that can go wrong to prevent this miner from paying itself off. If Litecoin mining, or ecurrency mining with GPUs in general takes a dive then you’ll at least have some hardware you can repurpose or even sell. If you found this guide useful feel free to send me a tip! I have a gaming PC which I mostly use on weekends, would there be a security issue if I do mining with it along with using it? I wouldn’t have any security concerns with running a miner on your gaming PC. I used my primary PC as a Bitcoin miner for quite a while before moving to a dedicated mining rig. Security starts to become a concern if you also keep your Litecoin wallet on the same computer you do a lot of web browsing on. Instead you might consider using an online wallet, or installing the wallet on another computer. You can easily create a script to launch cgminer so when you’re not playing games you can be generating coins instead. Litecoin mining does generate a decent amount of heat and noise though which can become a problem if your gaming pc is located near where you sleep. Good article I read all the way though been searching Bitcoin and Litecoin. I think the ASIC device kinda make mining with self built rigg not fun anymore. I probably mine lite coin just for a hobby cause I think it cool. 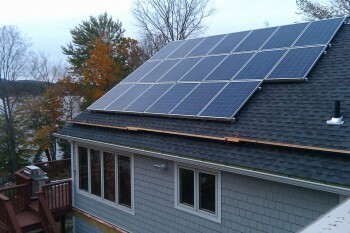 As for electric it free cause I have solar and wind turbine.